We deal with all types of homeowners. There are those who want whole-home renovations which include windows and every kind of door you could imagine (garage, garden, patio, storm, entry…). And, there are those homeowners who want smaller projects, like a new patio door or a new bay window in the master bedroom. Here at Brock Doors and Windows, we love working with them all. Of course, certain times of the year, we see an influx of various types of projects. One of our favorites? Toronto, ON patio door projects! Helping homeowners complete their dream patios is so much fun for our team. And, it will be for you! Have you been looking to upgrade your patio? Do you already know what patio door you would choose? Come visit us! But, before you pull the trigger, know there are a handful of things your patio door should do for your home. If it’s ugly, why add it to your décor and exterior? Lucky for you, we do not offer ugly products here at Brock—so you can’t go wrong! But, seriously, your patio door should be attractive and complementary to your home’s structure, colour scheme, design, and personal aesthetic. Brock’s high-performing patio doors are specifically engineered to hold in the comfy air and keep out the cold, wet, or summer heat. Shouldn’t the products you choose to add to your home help save you money on your energy costs? We think so. The environment is near and dear to our hearts here at Brock, as it is to so many, globally. We offer several unique glass coatings to help you make the best decision for you, your home, and your immediate environment. These coatings reflect heat back toward its source: your home’s exterior or the sun outside. Pretty neat! Whether you’re near the airport or a school or on a quiet corner of your neighborhood, you probably desire peace and quiet when the time comes to relax. Our high-quality patio doors are made with built-in buffers and perfect seals to drown-out loud sounds. This works both ways, too! Do you have a noisy family? Great! Let them have fun; the sound will remain indoors. Ever opened a patio door that wouldn’t easily slide? Tradition steel and nylon wheels can develop flat spots over time. Brock uses a material with much higher mechanical strength so this never becomes an issue! Safety and security are important to us all. Your home is your safe place. We offer several lock options including a multi-point lock, a solid key lock mechanism, an easy-use security bolt, and the standard single-point lock. What type of homeowner are you? A whole-home renovation one or a small project one? Doesn’t matter—we’d love to work with you. 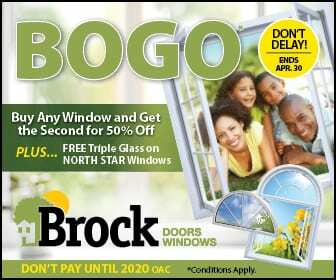 Give Brock Doors and Windows here in Toronto, ON, a call!